"Red Socks at night, | carpe diem! And you can warm your hands at them, too. I think it works. Thank you, Miriam, for clarifying the toe-up heelflap sock. These socks fit. 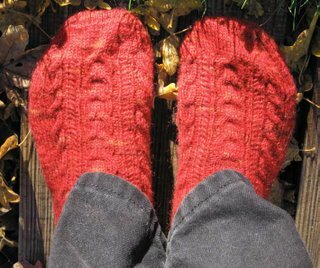 They fit like hand-knit socks. I have to tug at them a bit to get my heel past the ankle, but as my foot slides home the ankle slips into place and it’s just… (almost) perfect. The foot is fractionally too big (I should have started the gusset about 2 rows/5mm earlier), but I’m not worried about it as the fit will change once they’re washed. The fit across my instep seems to be perfection. No sense of constriction at all. If you ever have been unsatisfied with the fit of a sock, this is the way to go, it really is. I’m a convert. I loved the look of the Porsche short-row heel with its clean, elegant sophisticated line. By comparison heelflaps look clunky, old-fashioned… a bit like the umpteenth-hand VW Variant estate that was our first car in the UK. We handpainted ours fire-engine red. But (how far can I take the analogy?) like the Variant, the heelflap meets all my? our? needs. Reliable, hard-wearing, easily repaired, you can sleep in it when the tent blows out in a Welsh hurricane. Too far. Just try the heelflap, people. Next on the sockneedles: socktoken socks for one of my sister’s friends. Time to share the pleasure by knitting for someone else. I have the yarn already. I have lots of sockyarn. I shudder to think how much I’ve acquired, and how quickly. About 6 months-worth if I knit nothing but socks. And yet every time I read a knitblogger’s description of some other sockyarn I want some of that, too. There I am, clicking for larger images, exclaiming over the colours, wondering what it feels like. Looking to see if they ship to the UK (other than Piece of Beauty, which is in the UK. Hurrah!). I didn’t think I had an addictive personality, but perhaps it’s just very, very particular. At least sock yarn isn’t fattening. Gah. I could be imagining what it would taste like, too. Having just finished a really frustrating hour-long conversation about a project (they hire me as a specialist so WHY won’t they listen to what I say?) I’m going to blow caution and the rest of the afternoon finishing this entry and whatever else suits me. Baking bread that’s already over-risen thanks to that, that… that CLIENT and trying to relax. Holding the phone to my ear for over an hour of increasing tension levels makes the muscles of my left arm lock into knots. Why do I never remember I bought a headset to prevent that? Anyway, here’s part of a socktoken and the start of a socktoken sock in Lorna’s Laces Bittersweet. Peculiar yarn, feels like cotton after the Bearfoot and I find it a bit splitty, too. I’m not at all certain I like it, I hope there’s not masses of it lurking in the stash. 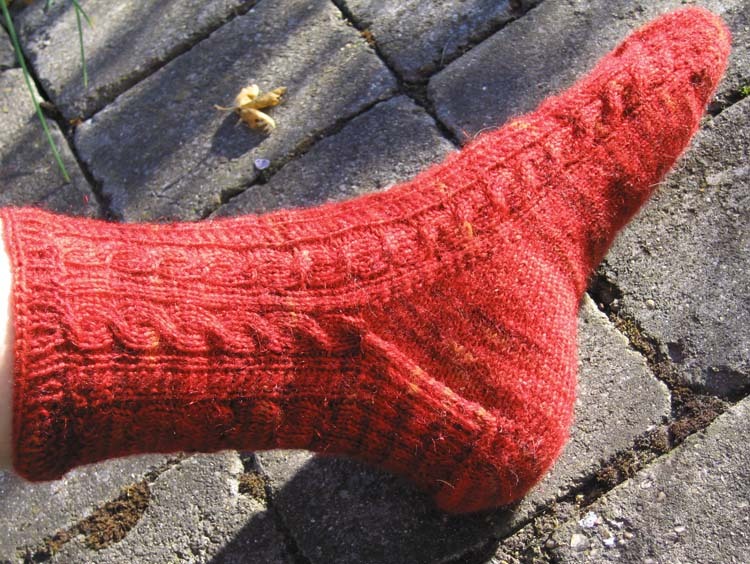 I did a little maths from my ongoing circular gauge swatch and worked out that a 66st sock would be about right for her foot, allowing for a little stretch. Cast on 18st using figure-8, blithely started increasing the toe, and realised I had almost no idea of what I was going to do with this sock, how I was going to pattern it. Now, this is a major milestone in my knitting life: never before have I just cast on and started anything without a plan of attack. I must really be comfortable with sockknitting 🙂 Which leaves me thinking about a simple rib, something with some ‘give’ to allow for variation in foot/ankle size, perhaps with a couple of details for pretty. Cables? An inset simple lace pattern? I need to chart some thoughts, which means I need some knitters’ graph paper, which means a visit here, where someone has kindly written a program to produce exactly what I (or anyone else) needs. Now I’m off to light the fire, put the bread in the oven, and knit until I’ve relaxed a bit. Question is, do I leave the next draft of that project until I’m less annoyed, or shall I get the annoyance over with tomorrow? Another conversation like that and I won’t have to think about it: I’ll bail. This entry was posted in Uncategorized on November 19, 2006 by sarahw. Knitting is the answer. I find that stepping away from the phone, the computer, etc., baking some bread, and going back to the knitting can really calm me down after an upsetting work interaction. I’m with you! Also, it all gets put back in context when you take some time away..I really enjoyed your 7-up story…because you know, I think we did hear when the pepsi can was punctured. There was a startling noise, but we ignored it. Silly us! We travelled yesterday and today, spent time together near my husband’s childhood home. I went to a fab yarn shop, bought two luscious bulky skeins of alpaca/wool yarn, several used books, including a novel with knitting in it and two cookbooks I’ve wanted, and we ate some great Greek food. We also bumped into one of my husband’s old neighbors and had an impromptu cup of tea with her family. Ended the day with a trip to an old estate open to tourists, complete with gardens, sheep and oxen, and a gristmill. Now I have some more stoneground flour for the baking when some other frustration happens! Taking a necessary break is indeed something to be thankful for…and I’m also thankful for friends like you! I wore the socks (with my Birks) to Pilates last night, and they’re as wonderful as I’d hoped. Warm, soft, just… lovely. Home. Comfy chairs in front of the fire for my feet. And I think I’ve got three more skeins of Bearfoot in the stash! Happy feet, happy feet. Wonderful warm socks!! A really nice pair for winter. I’ve got folks like that through my work…they stress me out so much I have to go and do something else for a while. 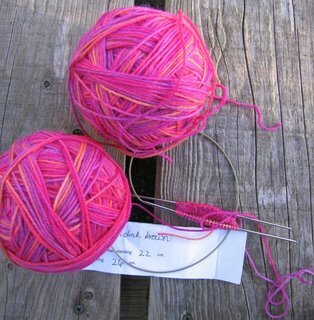 I’ve also knitted a row or two at a time trying to calm down when they refuse advice…Take a look at Katie Knits in Australia…she has some nice sock yarns through her Live2Knits business! I’ve got the Monet which I can’t wait to try.